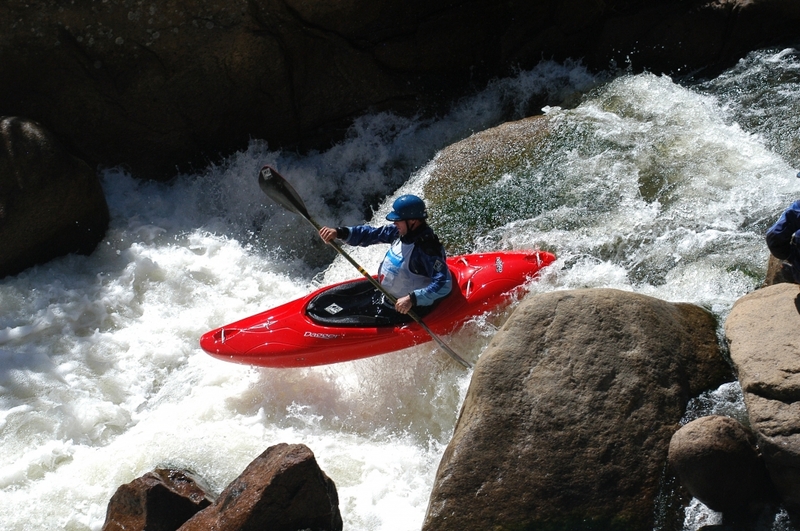 Colorado’s Front Range was the place to be the weekend of June 9-10 as competitors of all walks descended upon tiny town of Lyons for the not-so-tiny-anymore Lyons Outdoor Games on the South St. Vrain River. Featuring freestyle, boatercross and for the first time a hair-raising creek race on a Class V stretch upstream, the event is putting Lyons on the map as a destination river festival. The creek race through the crux of the notoriously steep and technical Class V+ South St. Vrain was won by Dagger Team pro Andrew Holcombe of Asheville, N.C., with Carbondale native Eleanor Perry (now living in Durango) taking top honors among the women. Holcombe edged out EJ by just five seconds, coming in at 3:19 compared to EJ’s 3:24 and Todd Baker in third just two seconds behind at 3:26. While all the creek racers were confident racing through the Class V waters, one in particular was more nervous than normal. Kelsey Thompson, who placed 17th, broke his two front teeth just a week earlier at the Teva Mountain Games, but still ponied up to paddle the St. Vrain. “On Homestake, I broke my two front teeth and put a hole through my lip that I had to get stitched up,” he says. “I spent six hours in the dentist chair, got root canals on both teeth, posts for extra support and temporary caps that look like Chicklets. When I get back to Canada I’m going to get permanent replacement teeth put in. In the Freestyle event, Dane Jackson beat his dad, EJ, for the first time, taking third behind Bryan Kirk and Nick Troutman’s massive loops in first. For the women, it was Emily Jackson besting second-place finisher Hanna Farrar, with Canada’s Ruth Gordon taking third.